So, I’ll leap right in this week! 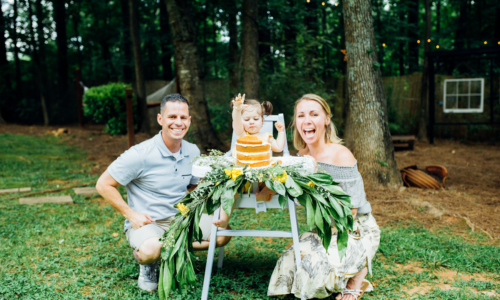 Last year, around this time, I met an awesome, hip, trendy, and fun mom that was in the throes of planning a “hunny bee” birthday party for her soon to be one-year-old. I was immediately enthralled with this theme. I mean, absolutely obsessed. I had this idea for the Scarlett Collection for years prior but – go figure – one of THE most difficult elements was deciding on a theme. I know moms often struggle with this, too, so don’t worry. I am here to help. We teamed up and here is where the magic happened. Her party was simply stunning. The photos I took for the Scarlett Collection are some of my favorites. But let me tell you, hosting this party outside really brings everything together in the most perfect way. I mean, it is SO fitting for the theme. Tori’s party featured an amazing charcuterie spread (y’all know I love charcuterie). This, of course, included honey. She also featured an awesome honeybee pallet backdrop that she used for photos, and a fabulous dessert display perfectly nestled between two trees. Florals are SUCH a key element that really take the honey bee theme to the next level, and Tori had plenty! We also included florals on the smash cake, as well as the cake for the guests. Honeycomb cereal. Omg, this was such a CUTE idea and a detail that I adored. Sprinkle wherever you’d like. Check out some additional photos from the party below. A huge shout out to Tori for the inspiration and being such a delight!